I began dancing with Szeged Táncegyüttes in 2000. That is where I became familiar with the fundamentals of folk dance and Hungarian folk culture. I performed at multiple Hungarian festivals and competitions with the group and took part in several international dance festivals and tours abroad. 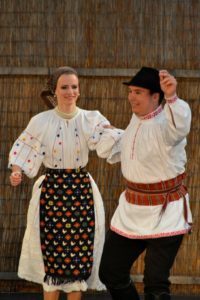 I also danced in the Szeged Táncegyüttes and Duna Művészegyüttes’s collaboration called Tavaszi szél és Aranyág (Spring Breeze and Golden Branch) and performed in the the Hungarian Folk Dance Ensemble’s production of Édeskeserű (“sweet and bitter”). Dóra Jávorszky and I have danced in the same group since 2008. Over the years, we began teaching together as well. Since 2012, we have taught multiple groups, choreographed, and instructed at dance camps. Dori and I would like to take advantage of every opportunity to nurture and pass on our culture. It is important to us that, along with teaching children and adults, we further our own skills by regularly participating in Transylvanian dance camps. As a young child, I had a window into the world of the dance-house by way of my older brother who is a musician. I began folk dance in 2004, then, from 2009 on, I continued in the Szeged Dance Ensemble. In the ensemble, we frequently did smaller and bigger performances and went to festivals and competitions. Sometimes I had the good fortune to do performance tours abroad and to participate in international folk dance festivals. At present, I’m a member of the advanced troupe of the Folk Dance Ensemble of the Technical University in Budapest. I’ve danced with Attila Cicieri for nearly 10 years. For the past five years, we’ve taught children and adults, prepared choreographies, and taught at dance camps. Along with folk dance, I’m open to many an art form. I was a student at the Szeged Free Waldorf School for thirteen years, where I was fortunate to try other forms of art. Because I hold dance to be a very important source of pleasure and joy, I’d like to ensure others, regardless of their nationality, the opportunity to become acquainted with the treasures of Hungarian dance.